The concerts were held on Saturday, October 29th and Sunday, October 30th, 2005 at the Shoreline Amphitheater in Mountain View, California. From Sugar Mountain, Saturday, 10-29-2005, Neil Young Set List and Sunday, 10-30-2005,Neil Young Set List. 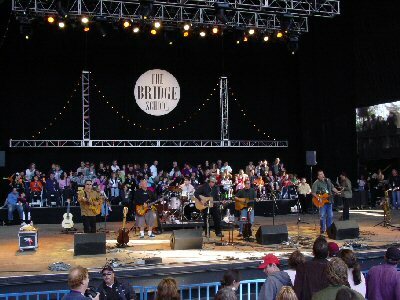 "The stage was great and all the kids from the Bridge School were there for the entire show cheering away and enjoying the music. Neil opened up to a standing O (at least from us) with I am a Child, and then Emmylou Harris came out and joined him on This Old Guitar, and the two of them together are magical. I love her voice and together the song really was special. Neil ended with Comes a Time and brought out some Native American friends of him to add some percussion and dancing, and it added a great element to the song. Even though I knew he would only play 3 songs or so, I was disappointed to see him go. The man still has it - hasn't changed since the last time I saw him, and he really is the best IMO. Los Lobos was next, and those guys are wicked. SO much energy and a great sound. The were the first to get the crowd on their feet, and then Neil came out and we couldn't believe it because usually that happens on Sunday - they did a wicked version of Cinnamon Girl and we all just rocked out. As a fan of Bright Eyes, I was impressed with his live performance. There have been many comparisons by people in my age generation with him being the "new Dylan", and whether or not that is accurate I won't say, but he has songs with challenging and meaningful lyrics and his band had a crazy variety of instruments. He invited Emmylou to join him for his last song, and even though she had to read the lyrics, she did a great job and really added to what I thought was an extremely moving song entitled "Walk Away", but I could be incorrect." "The concert took a turn for the better once Harris took the stage with her longtime musical companion, guitarist Buddy Miller. The best moment of Harris' set--and, indeed, one of the finest of the entire concert—-came when Linda Ronstadt made a guest appearance for "High Sierra," which was featured on 1998's Harris-Ronstadt-Dolly Parton collaboration "Trio II." Lewis was next up at the plate and proceeded to hit the first pitch he saw (as well as the second and the third and ... ) right out of the park. The rock-n-roll patriarch, who is readying a major comeback album for an early 2006 release, sounded strong both at the mic and on the piano as he jumped through the all-time classics "Whole Lotta Shakin' Goin' On" and "Great Balls of Fire." His performance was nothing short of a revelation, given that nobody expected him to be nearly as good as he was on Saturday. Jones was put in the tough spot of having to follow The Killer, and she managed to do as well as humanly possible as she cuddled into the jazzy gems "Creepin' In" and "The Long Way Home." "Neil and Pegi Young sure know how to throw a clambake. As the all-star cast circled around the four horsemen -- Crosby, Stills, Nash and Young -- joining voices on the "Teach Your Children" finale Saturday at the Shoreline Amphitheatre, a golden glow descended on the stage full of singers and children with parents underneath the by-now familiar logo for the Youngs' annual Bridge School Benefit. In a funky hat and a wooly sweater, Neil Young himself hovered over the entire affair, starting by opening the concert in the full afternoon sun with "I Am a Child," sung largely to the Bridge School disabled children in the special onstage seating section, his back to the audience, before bringing out Emmylou Harris to sing harmony on "This Old Guitar" and "Comes a Time." "
"The closest this year came to a magic moment was Jerry Lee Lewis. There were plenty of good moments until then -- a short and sweet set by the vastly talented Los Lobos that included a guest shot from Young for a rockin' 'Cinnamon Girl." There was a surprisingly decent acoustic set from brothers Benji and Joel Madden of Good Charlotte, who spent part of their youth in nearby San Jose before heading east to form the band. 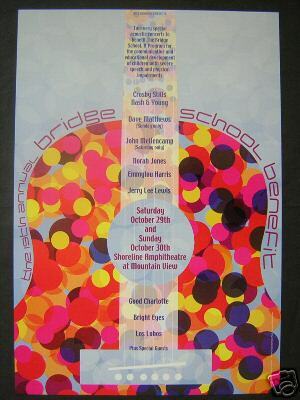 Harris, who's seemingly made a living as a Bridge School guest star, was typically riveting, especially when joined by the powerful voice of Ronstadt on a great version of "High Sierra," from "Trio II," the 1999 record they made with Dolly Parton." "The show. Well, details have been posted here, so I won't tell you all the gory details of what I thought, but I will say a couple of things. One, I started crying when Neil was facing the Bridge School kids and bouncing around and strumming and singing "I am a child." Oh. My. God. And it appeared that Neil was wearing an old hat of his dad's, it was a kind of fedora looking hat, the kind an old-fashioned reporter would wear, with a press pass tucked in the band. (He had the press pass too.) Oh my again. And, I was happy to see Neil looking supremely cool and well, Neil-like, and out of the Prairie Wind get up, personally. This Old Guitar was predictable, of course, since EmmyLou was there. But Comes a Time with Pegi and EmmyLou? I think he could have come up with something a little more original. We heard CAT during every show of the mini-benefit-tour last year. And he has SO MANY SONGS. Why the same ones over and over. But ... That being said, I am in tears and on the edge of my seat NO MATTER WHAT He is singing, I don't care what he does, I love every second. Just want to make that clear. Heh. And when he came out to do CG with LL, it was one of the Neil performance highlights of MY LIFE, I love that song, it was the first Neil song I fell in love with so long ago, and I had never seen him perform it live. (!) Now I have. : )"
Los Lobos Set List and awesome photos.